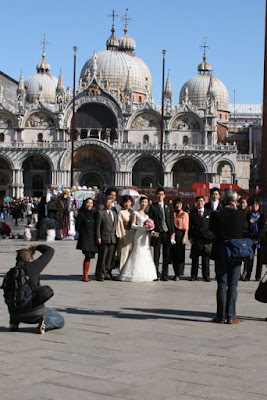 You all know how much I love brides, and on this last trip to Venice, I watched a particularly gorgeous wedding party having their photos taken in Piazza San Marco. They were happily chatting in both English and Japanese. The mother of the bride's kimono was absolutely gorgeous. And look how delighted they all seem to be! 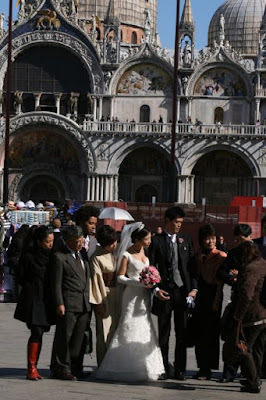 What a small world we live in... a Japanese wedding in Venice in three languages... I wish them every happiness -- wherever they may be! Thanks for joining me for DeliciousBaby's Photo Friday! 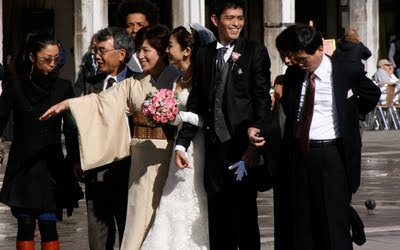 How nice to see smiles in the wedding party faces - I saw several brides and wedding parties in Japan and they were so formal, and wouldn't smile! thanks for visiting my blog, what a lovely post!